Awareness: Non-judgmental acknowledgment of reality of one’s thoughts and actions. Simply being aware of these can be the start of understanding them and preparation for positive changes. Kindness: Non-admonishment, gentle acceptance, and tender feelings for yourself opens the door to positive changes. Treating yourself as you would a small child can serve as a good example of how best to proceed with you and your body. Curiosity: Pleasant and/or fun exploration of more positive alternatives. Be a detective instead of a stern disciplinarian. Learning from what appear to be negatives can turn those into more positive future practices. 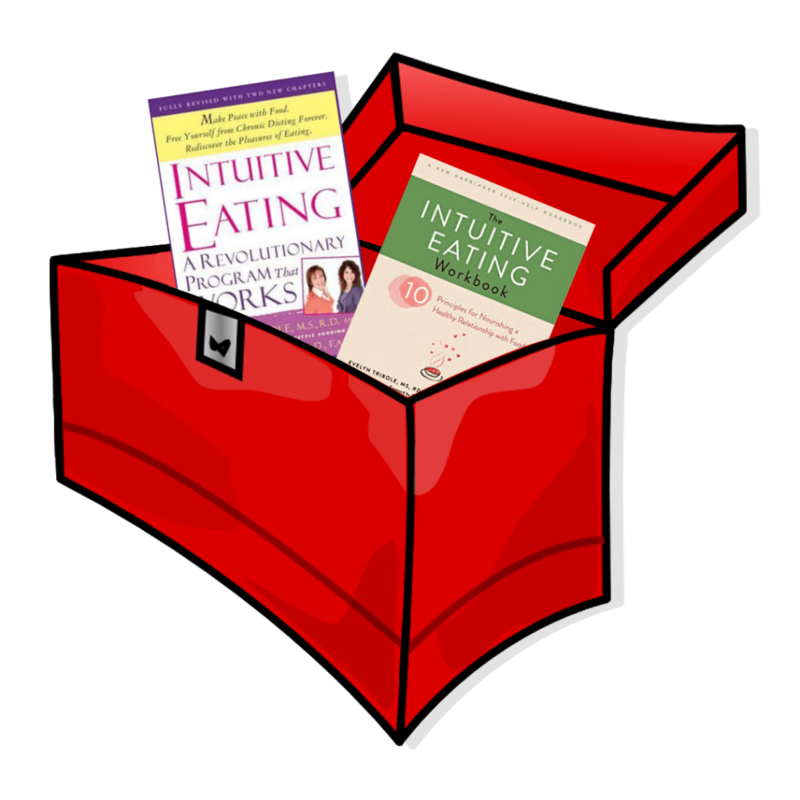 Time: Gift yourself time to acquaint and develop intuitive eating practices. Process over perfection (unrealistic expectations) is what makes an IE journey happen. Patience: Play tortoise to the racing hare that diet mentality encourages. “Slow and Steady” and “Easy Does It” makes an IE journey as well as helps to calm raging rebellion. KISS: Keep It So Simple. Taking on just ONE IE aspect at a time reduces stress and pressure. An old Chinese saying “A journey of a thousand miles begins with a single footstep” applies to the IE process too. Baby steps do add up! Support: While the IE process is mainly one of reconnecting with each person’s INner self, it’s important to not feel alone or do battle with diet mentality all on your own! The IE Community Forum is an island of support in a world that is otherwise a constant bombardment of diet mentality. Only YOU can know what it is that you need, even if it is only to vent frustration! Getting support is understanding that you get back what you put in. Immersing yourself in the forum can help you develop your own nurturing voice as others share theirs with you. Which of these tools do you feel is most valuable in your IE Tool Box? Please share in the comment section below. Reminder To Self: Dieting Is Awful!